You are holding an unusual book in your hand. 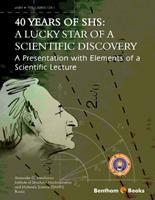 It represents a view of one of the authors of the scientific discovery of “Solid flame phenomenon” academician A.G. Merzhanov, who is a recognized leader of the scientific-and-technical area of “Self-propagating high-temperature synthesis” (SHS) all over the world, on the forty-year path from the scientific discovery to science-intensive production. It is neither a book of memoirs nor a scientific monograph; it’s “a presentation with elements of a scientific lecture” as the author determined it. The book is an expanded version of the lecture delivered by A.G. Merzhanov at the International conference dedicated to the 40-th anniversary of SHS. He is telling about people, scientific discoveries and important events rather emotionally and brightly. Besides there is a set of illustrations: diagrams, tables, schemes, photos which demonstrate the most remarkable (from the author’s viewpoint) fragments of the variegated picture of the SHS development. The author is paying much attention to a little-known initial stage of the investigations in the former USSR. At the same time a modern situation in the SHS area is being considered and the most promising tasks for future development are being defined. Perhaps, you won’t agree with the conclusions of the author. Probably, you consider some other events and results to be more significant. It’s a normal situation for such an alive and growing area as SHS. The author characterizes this work as “a subjective opinion of a person who has been working within the direction actively for 40 years”. But we are sure that the open-hearted, well thought-out position of the Father of SHS, his keenness and energy won’t leave the readers of this book indifferent. I have prepared this paper because before the 40-th anniversary of SHS I wanted to share my knowledge, impressions and ideas with you and tell you about the origin of the investigation in this field, about the Pioneers of this direction, their achievements and interesting result. The task appeared to be rather complicated because I had to expound the material thoroughly without any faults. It was difficult, and I know that some events were mixed “in time and space” and I paid more attention to the initial stage of our activity. But it was the most important period which was hardly described in literature. Besides, I know the work carried out in our Institute much better than that made by our colleagues from other organizations. That is why I am sorry, but there are more examples of our achievements. Submitting the paper to your judgment, I’d like to underline that I consider it as an essay. I am trying to express a subjective opinion of a person who has been working within the direction actively for 40 years. Also I’d like to express my gratitude to all my colleagues who helped me in preparing the manuscript.